Cupcake fans will be happy to know that Crumbs Bake Shop has opened their Paramus location today at Garden State Plaza one week ahead of schedule. The shop is located on the lower level of the mall near the food court across from Foot Locker. Many are familiar with Crumbs due their 60 locations spread across 10 states. 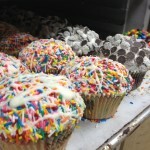 They serve fresh baked cupcakes (50 varieties) and cakes and have been on quite an expansion tear since their first location opened in NYC back in 2003.